I don’t really remember when dates became such a fundamental part of my life…and I don’t mean that metaphorically. Growing up in the Gulf, we were always surrounded by dates & in an abundant variety: dried, semi-dry, fresh (balah). But when exactly did I start eating them, enjoying them and become obsessed by them? My earliest memory of taking delight in dates is the traditional Palestinian date Kaak which my mother and aunt used to make for Eid , which to this day remains unrivaled as the sublime companion to my revered coffee. Since then, dates have taken on a fixed, sacred ritualistic presence in my life in various forms: a simple kholas date, sometimes stuffed with a little nut butter to accompany my morning coffee (roasted coconut butter being my favourite…divine! ), or a date ‘power’ ball with my post-workout coffee. I’ve started making date kaak myself for Eid now and I cannot out into words the pleasure I take in watching my own family savour them (my husband and my eldest son are serious addicts!). It was only a matter of time I suppose before I found a way to combine my two true loves, dates and coffee, in this date & Turkish coffee Tiramisu. I love to use Palestinian medjool dates, for my date recipes, which are large and rich in flavour. Line a metal loaf pan (9.25 x 5 x 2.75 inches) with plastic wrap, allowing the plastic to overhang on all sides. Put the mascarpone in a large bowl & stir a few times until smooth (don’t over-stir). Beat the cream & sugar in an electric mixer until you have soft peaks. Fold the whipped cream into the mascarpone, then fold in the custard, date molasses, cinnamon & cardamom with a rubber spatula until just smooth. Cover & refrigerate. Make the Turkish coffee & place it in a shallow bowl to cool. One at a time, dip the ladyfingers in the coffee mixture until soaked but not soggy; arrange in a single layer side by side over the bottom of the pan. Spread one-third of the mascarpone custard over the ladyfingers then sprinkle a third of the chopped dates on top. Repeat with another layer of coffee-dipped ladyfingers, followed by the mascarpone mixture & the dates two more times. 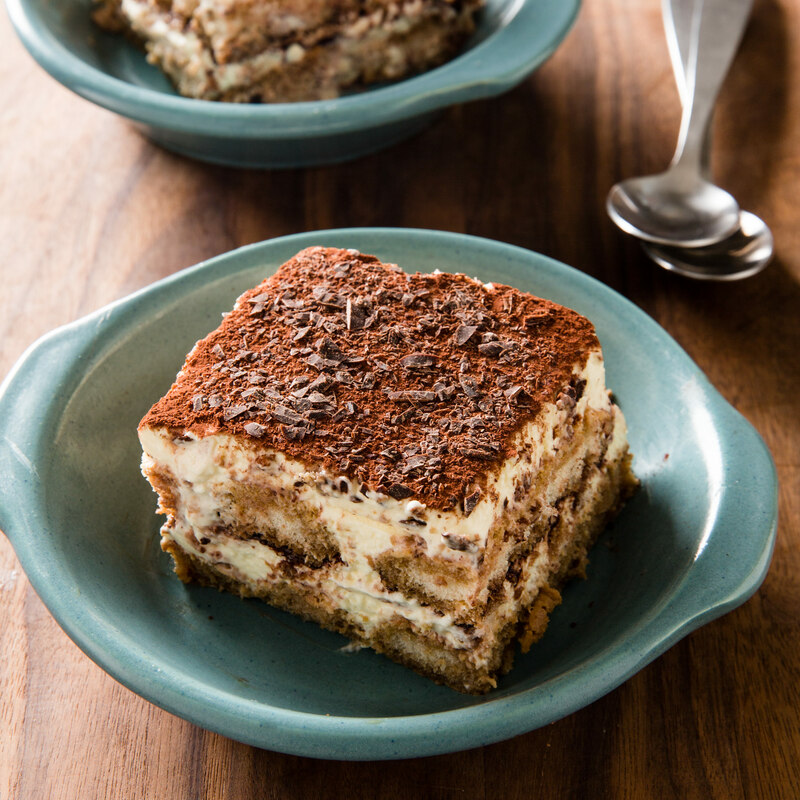 Dip the remaining ladyfingers in the coffee & arrange side by side on top of the tiramisu. Press lightly on top (it’s OK if the last layer extends over the edge). Cover with plastic wrap; refrigerate a few hours, or ideally overnight. Unwrap the plastic from on top of the tiramisu. Invert the tiramisu onto a platter & remove the plastic. Sift the cocoa over the tiramisu or shave curls of chocolate on top with a vegetable peeler & serve.